Click the ‘Advanced’ tab (because developers are advanced users… right? 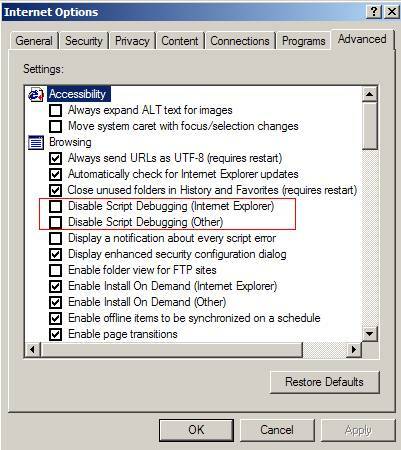 ), and untick the two boxes ‘Disable Script Debugging (Internet Explorer)’ and if necessary, ‘Disable Script Debugging (Other)’. Click the Apply button and restart IE. Note: You must have admin privileges to disable these options, as well as having Active Script Debugging installed on your computer. Active Script Debugging is usually automatically installed with Office or VS.NET. Alternatively, you can download Microsoft Script Debugger from the MSDN website.